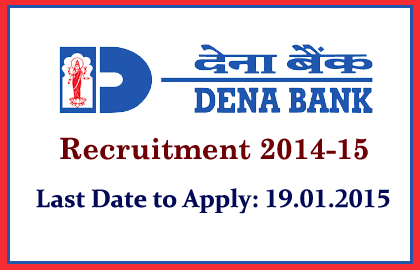 Dena Bank has announced openings for the post of Faculty. Eligible Candidates can apply for this post on or before 19.01.2015. More details regarding this recruitment were mentioned below. Eligible Candidates can apply for this post by filling the application form which you can download from the link given below. Along with your filled application you have to attach all you relevant documents and send it to the below mentioned address. Your application should reach on or before 19.12.2015. Candidates can pay their fees by using the Payment Challan, which you can download from the link given below and visit the nearby Dena Bank Branch.